February 12 is a day anyone who was privileged to know Marc Small will never forget. On that day in 2009, Marc—then my fiancé—lost his life in Afghanistan serving our nation as an Army Special Forces medical sergeant. Instead of planning our wedding, I launched a nonprofit in his memory called Small Steps in Speech. I shared the story of launching the organization in a Leader article, which also explains how Marc thought of the name originally for my future private practice. Jumping forward 10 years…. the legacy of Marc Small has changed the lives of children and their families across the country. Small Steps in Speech assists children with speech and language disorders by funding supplemental treatments not covered by insurance. Our goal is to help children better express themselves in our world. Since 2009, we awarded more than $1.3 million in grants to more than 900 families across the country. Volunteers perform the vast majority of the work, so nearly all of the donations go to recipients. Private donors, fundraisers and partnerships with like-minded organizations, such as the Prompt Institute, provide the majority of our revenue. I started this organization not knowing anything about how nonprofits work purely motivated by keeping Marc’s legacy alive. I learned to lean on others for help over the past decade…and the help is out there! Delegating my ideas and turning them into action for others is still tough but Small Steps in Speech wouldn’t be what it is today without a team of volunteers and board members helping me each small step of the way! Even with our numerous success stories, we still turn away more than 50-percent of our applicants due to our limited funds. As we celebrate this 10-year milestone, we’ll work to develop new partnerships with granting organizations to increase our reach. Each quarter we receive testimonials from parents, SLPs and other professionals providing treatment—such as occupational therapists—sharing how they or their child benefited from a Small Steps grants. We provide funds for months of treatment to a child without insurance coverage, fees for intensive summer camps so children with a stutter can study and interact with peers, fund hippotherapy for children with autism, and provide augmentative and alternative communication devices for nonverbal children. The needs are seemingly endless. I currently work full time as an SLP in the New Jersey public schools. Everything I do as the executive director for Small Steps happens during my off time—as it does each of my board members. We are a board of all women and all volunteers! We all work full time, have families and do Small Steps in Speech each day and night on our own time, sometimes checking email in the middle of the night to make sure we get our mission accomplished. My biggest struggles, like those of many nonprofits, entails learning to write successful grants and host successful fundraisers to keep the organization running. When we first started, getting our name out to SLPs throughout the nation was another hurdle. “How will they know we exist? How will they know they can nominate a child for treatment who can’t afford it?” Those thoughts kept me awake at night. Going to the ASHA Conventions each year helped solve that challenge and many others. We also used social media to help spread our mission. Even though Small Steps in Speech has made big strides in the past 10 years, we hope to help even more children over the next decade. Marc Small inspired this organization and we will all think of him during this 10th anniversary month and year. I know he would be humbled to know that so many lives have been improved by his spirit as his name and legacy continues. 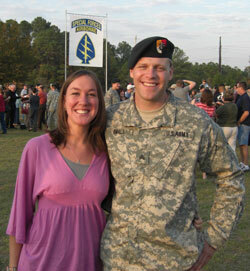 Small Steps in Speech is a non-profit foundation created in memory and in honor of Staff Sgt Marc J. Small who was killed in action in February of 2009 while serving his country in Afghanistan. Small Steps in Speech assists children with speech and language disorders by funding supplemental therapies and treatments for individuals. Our goal is to give children the chance to better express themselves in the world in which we live. Since 2009, Small Steps in Speech has awarded over $1,000,000 in grants to over 800 deserving families across the country. Small Steps in Speech is privately funded through individual donations and fundraising activities. We invite you to support our work with children through either an individual donation, by participating in one of our fundraising activities or by holding your own fundraiser to support Small Steps in Speech. You can change the life of not only a child but also their family with the gift of improved communication. Do you know a child who would benefit from additional services or treatment? Please share our information with them and consider applying for a grant. All Speech Language Pathologists – if you know of any child who would benefit from financial assistance to help with their communication where insurance does not cover, nominate them today! In 2015, Small Steps in Speech awarded 182 grants to individuals or other charitable organizations. SSIS provided grants in 26 states throughout the United States and are continuing to spread our mission within the USA to assist children who have speech and language disorders. We are privileged to say that we have provided children the opportunity to receive speech and language therapy for months, and even a year, to help improve their communication.